Christmas Eve message: You can trust Him. I don’t know whether this really happened or someone just made it up. But it still is a useful thought to share with you tonight. There was a guy and he said to his friends that he has made up his mind and he will no longer be a member of his congregation. If that’s all one hears, it is sad. That’s quite boring an experience. Then one misses out on riches, joys, peace, wisdom, comfort, hope that God daily shares with His chosen people. Then it is like you get married, and promise to stick together till death do part you, and then you see your spouse only once a year, for a few minutes, and then you just talk about how terrible the weather is. Who would like to live in marriage like that? But many have relationships with God just like that. I remember that I was in that situation. That was me for quite a few years. When Christmas came, something made me to come to service. And it felt good. Everyone was so nice. Everything was so nice. That’s true – it is good to be in God’s presence. We can sense it. And I usually felt quite uplifted after. I felt like I had done something good. I felt that I was good. I wasn’t like those heatless and soulless people who didn’t go to Christmas services. I was there. Do you know why I did it? Some may guess, because I had faith. No, I didn’t. What people often call faith, saying “I have my faith” is nothing more that the knowledge of God that is built into us. We can’t erase it. But that is not faith. True faith is when you know God as a person, and you trust Him as your loving Father in Heaven, and when you know Jesus as your Saviour, who loves you till death, and when you respond to His love with your whole being. It is similar as in marriage. It would be stupid to say “I love my spouse, but we almost never meet, for I don’t want it.” If you love someone, you want to be with them, you want to talk with them and you want to make them happy. People often say “I have my faith”, but in fact we don’t believe what God says. To great extent it is true for all people, all of us including. For hundred years God warned that the Earth will be destroyed. We didn’t believe. But it happened, the flood came and only those who trusted Him were saved. Mighty Egyptians didn’t believe that their kingdom could be shaken. They had so many gods to protect them, they were so powerful, but it happened. Exactly as God warned them through Moses. God’s chosen people didn’t believe that their own God would kick them out from the promised land into exile, they thought they could ignore Him, and do whatever they wanted. But it happened, He did exactly what He had foretold. God said that He will come as one of us. And no one believed it. But He did, at appointed time, in appointed place, in this very strange and humble way, being born as a little baby, later living among us, dying for us and rising again for us. Now there is one more promise that is not fulfilled. And you know what it is. The second coming of Jesus, when He will return in His divine glory. When holy God will purify the entire creation and will destroy all evil. When He will gather all people before His throne of glory and everyone will be held accountable. Not according our strange ideas… but according God’s holy will – which is revealed to us. Every time when God promised something that we couldn’t understand, most of people didn’t believe. And every time He did exactly as He promised… and we still don’t believe Him… do we? There is only one promise left. Only one thing to be done. And He will do it again. He certainly will. And when He gathers all nations before His throne of glory, where will we run then, where will we hide? Now we have this frightening freedom – we can reject His invitation. And so often we do. We just ignore Him. We pretend He doesn’t exist. But when God comes in His glory, no one will be able to say ‘no’. Who will help us then? Who will help you? You have only one hope. Only one. This baby. Jesus from Nazareth. 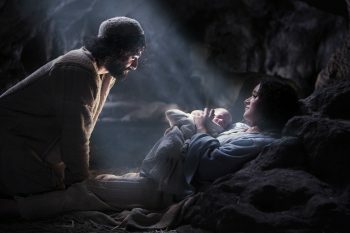 The same One, whose birth already Adam and Eve longed to see, and whose birth is celebrated already for two millennia. God came as one of us to offer us the most wonderful exchange. Jesus comes and invites: “Give me your sins, let me free you from your idols, that enslave you and rob you of freedom and joy, give me your guilt, I’ll take them from you. Don’t be fools, don’t cling to your sins and don’t protect your idols, they do nothing good for you. Turn away from them! And in exchange I will give you forgiveness, and freedom, and life, and wisdom, and hope, and joy, and peace. God came to us as this little baby. He grew up and then took our place on the Last Day, He took what we deserve, He took our death. He did it to assure you that you can trust Him. If He was ready to go through such a pain for you, He will keep His promises, He will have you with Him in His eternal Kingdom. You can trust Him. Just stay with Him. Allow Him to love you and bless you. Allow Him to speak to you, to make you wise, to change your heart, and at the end to raise you to live with Him in ever-lasting peace, and joy and happiness. Let this day be a reminder to you that this is what Jesus offers you. Each of you. For that is Him who says to you: “Come my child, return to me, for everything is ready.” Remember, you can trust Him. Amen. The peace of God that surpasses all our understanding keep your minds and hearts in Jesus Christ.